Once again, I've no idea what this crab is! I thought maybe a ghost crab, but this is about 10 cm big, not the 4 cm that ghost crabs grow to be (this is my post on Ghost Crabs). Then I thought maybe surf crab because apparently they're the only crabs in Sydney with two red spots on their back - but must be different down the coast, because surf crabs have modified back legs as swimmers, and this guy just has legs. 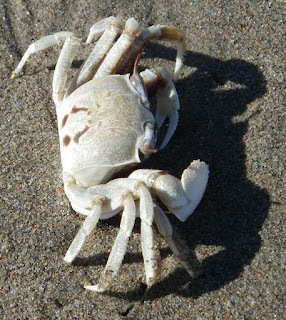 It's like what I'd call a fiddler crab with one nipper much much bigger than the other...and maybe that's just what he is. You can find some info here. and that's not where I found this one. Our beach is a sandy beach and we're halfway along, so no stones or rocks are near us. We are near a river and a sandbar, so it's possible he got washed into the sea and I was just lucky enough to catch him coming out. As a cancerian, crabs are always cool and you are not mad.